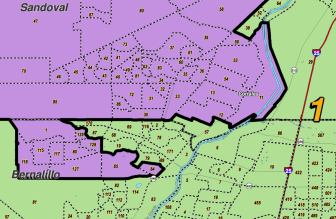 The 2011 Congressional district map had to be finalized by a judge. A plan to give individual voters more influence in elections is expected to get a second hearing this week. The proposal (HJR 1) introduced by Rep. Carl Trujillo, D-Santa Fe, would amend the state constitution to create an independent citizen group in charge of redistricting. Because the proposal is a constitutional amendment, some of the plan would be put to the voters, and some of the details would be worked out by the Legislature next year. The plan had its first hearing Friday in the House Government, Elections and Indian Affairs Committee, but members asked Trujillo to simplify some of the language and leave some of the minor details for lawmakers to sort out next year. It has since been revised and is expected to be reheard Wednesday. Every 10 years, after the national census, New Mexico takes those new population figures and redraws districts for Congress, the state Legislature and other elected offices. But critics say the process is so politically-driven that it makes our elections less competitive and our officials less responsive to their constituents. A 2012 report from the Center for Public Integrity (conducted by this reporter) found in recent years the process rarely works the way it’s intended, often ending up in expensive litigation. Cosponsor Sen. Bill O’Neill, D-Albuquerque, said he recently mailed out 4,000 questionnaires to voters in his district, and according to his analysis, the vast majority the responses are in favor of moving redistricting to a group independent of the state Legislature. “I always lead off with electoral reform, so the first question is: Would you support the establishment of an independent redistricting commission composed entirely of private citizens to address the problem of gerrymandering?” O’Neill said. “It’s at least 95 percent [who] say yes!” O’Neill said. Trujillo said Monday that the bill has bipartisan support–and some bipartisan opposition. If the bill makes it out of the House it will likely be by a small margin. Similar proposals have been unsuccessful in recent years. he state energy plan recommends creating an education campaign and a “rapid response team” to provide information on the energy industry. State officials should also remember they serve the public by talking to reporters.